Miss Sadie and the Cowboy woke me up at 7:30 this morning with a polite low growl from herself and a blast of doggie breath from you-know-who. It’s time to get up and make our breakfast, they said. It’s impossible to argue with a terrier and a spaniel at the same time. You’re right, I said, pulling on my snowpants and snow boots and down coat and fleece hood and glove liners and ski gloves. But first, let’s go get the paper. They looked dubious, but they know the drill. If I do not keep to my little rituals in winter the day loses all shape and I flounder. I pulled back the window quilts and we peered into the snowy dark. Can’t we just have breakfast? I pulled the door open and shooed them outside. They dashed down the steps and headed for Appropriate Spots. I began to sweep the snow off the stairs. I was barely halfway down when they tore past me, aimed at the door. Two blurs flew in and settled in front of the wall furnace. That’s how cold it is Around Here this morning. I fed the Duo and finished sweeping the stairs and proceeded, without much hope, across the road to the mailbox with its little green newspaper tube. Could it be? Tire tracks curved toward the mailbox and away again. YES! Dean Peters had braved the cold and dark and snow to bring me my Record Eagle! Oh bold navigator, bringer of news from the outside world. My hero. So now we have all had breakfast and we’ve built a fire and I can settle down to read the paper and do the sudoku puzzle. We’ll just see what we get up to after that. I know a person can read newspapers and do sudoku puzzles—even read blogs!—online, but it’s not the same. It’s just not. Ah. You have window quilts. Much better than dragging out fleece sheets. “Wall furnace?” Not sure what that is. A wall furnace is a tall, ungainly beast vented directly to the outdoors, generally fired by propane or natural gas. It can put out a surprising amount of heat quite efficiently. Oh, I see. Looked up images. Could also just be called a heater on the wall…like in a hotel or something. Depends on the design. Some of them are not bad looking and deserve being referred to as “wall furnaces”. Very nice. Why thank you. Mine looks like a tall metal cabinet. Miss Sadie and the Cowboy gather in front of it in cold weather. Me too. Good to hear you are hanging in there! It might start getting a slight bit better this afternoon…although that could just be hopeful thinking. Stay warm! You too, Wendi. At least it’s nice and light out there. Not that we’re going anywhere. I know what you mean about the importance of that particular daily ritual (although mine involves the NY Times crossword and the Free Press funny pages, by which I mean the coverage of local politics). Life as usual has been rudely interrupted by the Arctic blast down here in the Deep South. I went two days without feeling the comforting touch of newsprint this week, and it did make me a little jittery. It crosses my mind that we had better make preparations for a future without paper. OK, without new paper. I predict that I will have my books around me for the rest of my life, even if I have to make them into a rude hut in the forest where I live with my dogs and become a terrifying Wise Woman. Maybe I need a nap. At first I thought you were putting on all that gear coz it was so freakin’ cold in your house. I was relieved it was coz you were going outside. Glad the paper came. Much prefer the real thing to on-line too. I have been known to sit at my desk with my down vest on and sometimes with a quilt wrapped around me, but so far it hasn’t come to the down coat and ski gloves. So far. In any event, hooray for the milkman and the postman and the newspaper carriers of the world. They help keep those wheels turning. A long time ago in Detroit I had a most wonderful milkman, who also brought eggs and butter on request, and another man who delivered bread and pastries from Awrey’s Bakery. There was a milk chute in the wall by the side door–a shelf just big enough for a couple of half-gallons of milk and a note, with a little door on each side. Then we sided the house and covered the milk chute and the milkman brought me a nice insulated milk box to put by the side door. Those were the days. For that matter, back then I had the Detroit Free Press delivered in the morning and the Detroit News delivered in the afternoon–and I read both of them. They were both fine NEWSpapers. It’s kind of a vicious circle: the papers get worse, and people read them less, and they get worse and so on and so on. 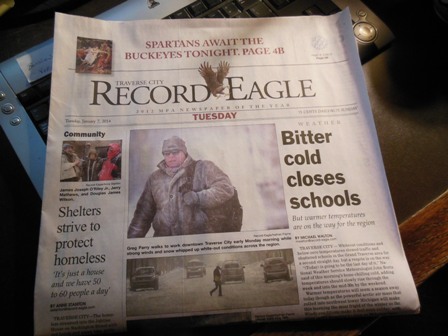 The Record-Eagle has really been going downhill, I think. This hit home when I ran across a paper from 1982. I’ve also noticed it with the Free Press. There is a decline that you really can’t only blame the Internet for. Of course, in the case of the Free Press, it just wasn’t the same after Bob Talbert died. Hello, d – I agree that papers aren’t what they were, and it’s a shame. I miss Bob Talbert, too, but I really like Stephen Henderson. There is nothing like settling down to breakfast with a newspaper in your hand. If I don’t have one, I am restless and unsatisfied. I suspect that you have a much more satisfying newspaper at hand. I wish that for you, anyway. A good newspaper and a good breakfast. It took Phyllis and Pat in Texas to inform me you were back and good news it is! Just reading over all the similar comments from your fans who are also thrilled to find you back online too. Wanted you to know we too had Swedish sausage recently and don’ t fret. We will be making sausage this spring when we return but in Ironton this year with Lisa and Matt. Look forward to your posts while we travel. Hello Chris – That is very good news about the Swedish sausage. I must look into properties near the Ironton market. I hope you will send an occasional Letter from Chris about your adventures on the road. Say hello to Sonny. Window quilts? I’ve hung blankets inside the curtains before, but never on the windows themselves. Don’t the quilts soak up the condensation (from all that dog breath) and the black mould? In my old house, where I didn’t have central heating, those things were a big nuisance. I’m glad you are staying cosy in there. I’ve only just heard about the Arctic temperatures you folk are enduring over there, mainly because we’ve had some seriously destructive storms here, on the coast anyway. I’m beginning to think that the north west, which used to be considered a dismal place to live because of all the rain, actually has a rather temperate and benign climate. We don’t seem to get the extremes here. I did a post about them once . . . lessee . . . be right back. My mom turned 89 and my dad turned 91 this year. Even though he’s nearly blind, mom still takes the paper News Paper because she likes the TV listings (I have not been able to teach her to channel surf, or use the on-screen guide that comes with their cable service) and does the crossword puzzle. The neighbor lady across the street, who is an “undercover angel”, comes over every morning and finds Mom’s paper in the yard and puts it up on the porch so mom doesn’t have to get out in the yard and hunt it. I haven’t taken a paper news paper in fifteen years at least, probably longer. You’re smart with your “door quilts” Next time you have to get new ones, get ones in a dark color. The sun through the glass will heat them like a greenhouse, and the dark color will take up a lot more heat than a light color. Oh dear. I can see that I am a dinosaur. I’m addicted to newsprint and I don’t even have television. At least newspaper reading seems to be associated with longevity. Your recommendation of dark quilts makes sense – except that it might just depress me. Not to mention that it would show the Cowboy’s fur something awful. Maybe I could get ones that are dark on one side and have a nice print on the other. Window quilts….sounds like a good idea! I agree, we miss the newspaper. They stopped delivering it every day here…can’t remember what days it would come..but husband finally went online to read it and it isn’t the same and now he doesn’t read it every day at all. Sad. I remember my Dad reading the newspaper to us when we were really little. Good memories. “Dad reading the newspaper to us” triggered such a strong memory – Dad reading the captions in the Major Hoople comic to me, and then turning to the serialized children’s Christmas story that was a feature of the Rhinelander newspaper . . . I can remember that the paper felt icy cold, fresh from outdoors and fragrant with printer’s ink and woodpulp. I can remember the rumble of Dad’s voice, and the delight of a story that would be continued. OK, now I’m going to go have a little cry. A good little cry, not to worry. Dang, I was typing a comment and it was suddenly whisked away into the polar vortex of the internet. I think it went something like this: I’m very happy to see that the stories of you and the duo are continuing. The personalities of the spaniel and the terrier never fail to come through. I hope Michigan is experiencing some of the warm-up we are having here in MA today – the thermometer is up over 50 as I type this comment. Deluging rain, however, will prevent much gallivanting. It definitely warmed up here, just enough to turn the packed snow on the road to packed ice covered with water. Then it cooled off again and now it’s snowing. Who knows what will happen next? Mama Nature, go figure. I AM SO GLAD YOU ARE BACK!!! Would say more but must go get a link to you up on my own blog again….